These notebooks and papers of James Watt and family are a superb source for social historians of the period. So much of this material has never been used by scholars before. Here we have several generations of an important family discussing trade, economics, politics, social affairs, health, medicine, travel, household goods, carpets and furnishings, treeplanting and the family estates. There is much material concerning Greenock and the merchant activities of James Watt’s father. There are many important letters between James Watt and his second wife, Ann Watt for the years 1779-1796. They cover both business and family matters, including Albion Mill, the copper trade, the Cornish miners, the bleaching process, the Hornblowers and Watt’s activities in London and Cornwall. Later boxes contain significant correspondence between Ann Watt and James Watt, Jnr. A letter of January 19 & 20, 1792 from Ann Watt to James Watt is typical of the frequent exchanges between Heathfield and London. She writes with a judicious mixture of gossip, news of friends, a couple of business matters, and a shopping list of items best acquired in London. Further papers relate to iron works in the 1790s, James Watt’s property and estates, papers and accounts of the Soho Foundry for the period 1778-1811, and correspondence with various agents for the Boulton and Watt business. 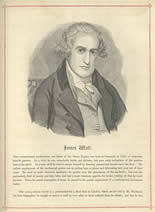 These documents allow scholars to examine the impact of Watt’s Steam Engines, study his business and personal life, evaluate the role of his son, James Watt junior, who from the mid 1790s onwards, increasingly assumed day to day control in the running of company affairs, and to see clearly the ties between business, industry and scientific inventions.